A data-led exploration into the Chinese trademark market reveals that filing numbers at the Chinese registry have broken records yet again, while domestic applicants have overtaken their US counterparts in EU and UK filings for the first time. Putting the automotive industry under the magnifying lens reveals that a shift in focus from West to East is beginning. Meanwhile, the proliferation of driverless technology is leading to a rise in trademark filings. The WTR Industry Awards 2018 – which will be presented at an exclusive ceremony at the Seattle Arts Museum – honour leading trademark teams and individuals across a range of sectors. We reveal the shortlist. 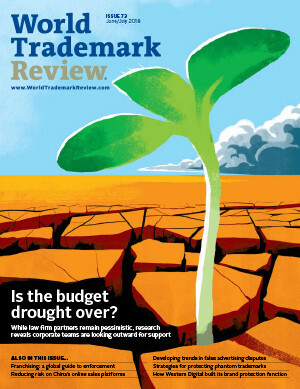 In the first of a series of interviews with leading corporate trademark counsel, World Trademark Review spoke to Cynthia Tregillis of Western Digital Corporation on collaboration in anti-counterfeiting efforts and the challenges of setting up a new brand protection group. Continuing our series of interviews with some of the world’s leading corporate trademark professionals, World Trademark Review spoke to Relani Belous, who outlines the brand challenges she faces in her role as general counsel of Stan Lee’s POW! Entertainment. The strategies used so far by owners of ‘.brand’ top-level domains in the first round - from full migrations to microsites - demonstrate just how widely it can be used. In the latest part of our series focusing on the legislative frameworks that govern franchising in Asia and South America, we discuss enforcement in Indonesia. As part of our deep dive into franchising in Asia and South America, we turn our attention to enforcement and termination rules in Thailand. In our series focusing on franchising across Asia and South America, we take a closer at the Peruvian legislation that governs contract enforcement and termination. As part of our deep dive into franchising rules in Asia and South America, we outline the rules that govern enforcement and termination of franchise agreements in Mexico. We take a close look at the Philippines legislation governing the enforcement and termination of franchise agreements, as part of our series on franchising in Asia and South America. This series outlines the legislative framework for franchising in nine jurisdictions across Asia and South America. In this instalment, we focus on the enforcement and termination of agreements in Chile. Three-dimensional trademarks have made headlines in recent years following high-profile successes and failures in relation to the registration of well-known brands. Looking at how these marks have developed over the past few years may help to determine what to expect in the future. Although phantom trademarks have clear advantages for their registrants, the US Patent and Trademark Office has been somewhat unpredictable in its response to applications for such marks over the years. Various strategies may help to enhance the likelihood of successful registration and use. For those seeking to tackle counterfeits on Chinese e-commerce platforms, insight into both historical approaches to illicit trade and the tools currently available is essential if success is to be achieved in this ongoing battle. With the Uniform Domain Name Dispute Resolution Policy firmly established as the go-to tool for resolving domain name disputes, regular review of panel decisions can prove critical in informing success when using the mechanism. Domainers, brand owners and the UDRP: can the gap be bridged? While the Uniform Domain Name Dispute Resolution Policy has been a great tool for addressing the issue of domain squatting, a healthy and even-handed debate over key principles is necessary to bridge the gap between the domain and brand owner communities. This two-part series identifies the ways in which diverse online sales platforms (OSPs) may affect brands in China, as well as some of the basic commercial and legal issues that brand owners should bear in mind when creating an OSP branding strategy. Although branding on online sales platforms remains a relatively new concept, its significance should not be overlooked. In the second part of this series, we consider how brand owners maintain can control in this evolving landscape. A government-issued emergency decree is set to shake up trademark practice in Argentina. Key to its success will be how the Argentine Patent and Trademark Office manages the transition, so we analyse what practitioners should be mindful of going forward. Mexican law follows international standards with regard to trademark licensing, and licensors can benefit from a licensee’s use of their mark even where the agreement has not been recorded. However, the local rules governing ownership in these circumstances are less clear. Trademark licensing is recognised under Italian law despite the absence of specific legislation governing agreements. When it comes to enforcement, licensees can provide evidence of a non-written agreement through various means. Under common law, ownership is conferred through first use of a trademark – including use by a licensee. Recent case law can help to determine which party has the right to enforce the licensed mark where an infringement suit arises. Rights holders can significantly benefit from a proficient licensing agreement, provided that both parties uphold their end of the bargain. Depending on the type of agreement, licensees must fulfil various obligations before they can reap the rewards of a well-established trademark. Foreign brand owners are free to enter into direct or indirect trademark licensing agreements in Russia. However, in order to be valid and enforceable, these agreements must contain key terms and be recorded with the Federal Service for Intellectual Property. The upcoming amendments to the Trademarks Act may bring short-term uncertainty over ownership and licensing issues. One thing that is unlikely to change is the established principle of proving a licensor’s control over a mark. Trademark and domain experts from the United States discuss the evolving landscape of generic top-level domains, exploring the challenges faced by the Internet Corporation for Assigned Names and Numbers and best practice in enforcement efforts.